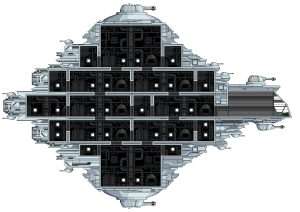 As the player progresses through the story of Starbound, they'll unlock additional upgrades to their starter ship. These additional upgrades provide more space on the ship for players to place objects, as well as crafting stations, containers, and furniture. In addition to more space, larger ships can hold a larger number of crew members. To repair the ship engines, enabling flight to other systems, players must clear the Erchius Mining Facility mission. After repairing the ship's thrusters and FTL drive, Penguin Pete, the shipyard captain at the outpost, will open quests to upgrade the size of the player's ship. These quests are given where he is stationed, just west of the outpost. To upgrade your ship you will need crew members, each upgrade also increases the number of crew members which can be on the ship. To get crew members you have to do generated quests for NPCs throughout the universe - either in villages or summoned tenants. These quests will earn favor with the quest-giver once completed, and they may ask to join your crew. The NPC type determines what role they'll assume on the players ship. Players can also recruit penguins as crew members from the Beakeasy bar beneath the outpost. In order to recruit penguins the bar must be reopened by defeating the mini boss Dreadwing. Then bar patrons will join your crew in exchange for a dubloon. Alternatively, there are illicit ship licenses which can be purchased for pixels from the Penguin Bay. These licenses will allow the ship to be upgraded without the requirement of crew, but players must still provide upgrade modules to Penguin Pete at the shipyard. Before 1.3, the upgrade level of the ship determined its planetary Tier which did affect Tenants spawned inside your ship. For example, merchant tenants were able to sell tier 7 or tier 8 random Weapons (normally tier 6 is the highest possible tier for random weapons). As of 1.3, the planetary Tier of your ship is always 1.
note: acquiring the required crew members produces an item that may land on the ground if your main inventory is full. Just pick it up and it will be consumed immediately, triggering the upgrade quest in the process.